The Bluetooth Speaker with Superior Sound and Playtime. Wherever life takes you, experience your music with powerful stereo sound and crisp, tight bass. Boasting less than 1% total harmonic distortion, SoundCore sounds great even at the highest volumes. 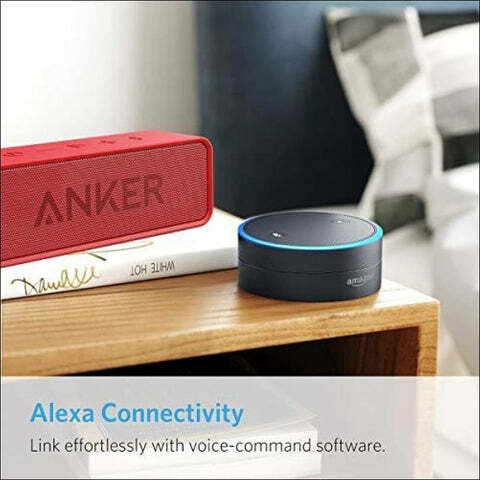 Anker's industry-leading power management technology keeps your tunes playing for up to 24 hours on a single charge—that's over a week's worth of playtime (based on average usage). To keep SoundCore small but also sounding great, we've designed it using a unique spiral bass port design. The result is a clean bass sound you can easily pick up and put in your bag. Unlike most other speakers, SoundCore uses the very latest Bluetooth technology to maximize device compatibility and pairing speed. ASTONISHING SOUND: Breathtaking stereo sound with deep bass is delivered with exceptional clarity and zero distortion by two high-sensitivity drivers and a patented bass port. 24H WORRY-FREE BATTERY LIFE: Anker's exclusive, long-life battery technology provides 24 hours of sublime music. EFFORTLESS CONNECTIVITY: Bluetooth 4.0 ensures instant pairing and maintains a strong connection up to 66 ft. DESIGNED TO PLAY: Combines a solid, drop-proof build with tactile materials and seamless controls. GRAB, GO, LISTEN: Lightweight, yet robust unibody design provides the perfect soundtrack for the park, yard, or anywhere else at home or away.